Have you heard about the power of Facebook Advertising? I sure wish I had sooner. Facebook advertising makes the entire book marketing process a whole lot easier. In fact, Facebook is able to turbocharge all of your long-term author efforts – building a mailing list, driving traffic to your website and learning all about your fans. If you’re serious about experiencing long-term publishing success, you simply cannot afford to ignore Facebook advertising. It’s that simple. Can Facebook Really Help to Sell Books? Facebook advertising has been a success story for many authors. There’s no better example than Mark Dawson. Mark started his writing career the traditional way – by being published through a company. However, as many authors discover, publishing companies don’t put much stock into new authors. So, of course, his sales tanked. The next time, Mark decided to self-publish. However, without any knowledge of book marketing or being a Kindlepreneurian, Mark failed again. Finally, Mark discovered the power of Facebook advertising. Investing real time and energy, Mark set forth to master this skill and on his third time, he found success. Nowadays, Mark makes over $450,000 a year in book sales thanks to Facebook Advertising. Facebook has ballooned to over 1.4 billion users with 70% of those checking their Facebook every day. It’s been said that Americans check their Facebook status on average of 7 times a day. Shoot, I won’t lie, I just leave mine up all day – I wonder how that plays into the statistic. So, there’s no way that your niche market or readers isn’t there. Each person who setups an account on Facebook readily gives away their information: Likes, favorite movies, favorite books, favorite actors, companies, etc…This information allows you, the marketer, to create the perfect most targeted advertisement ever. So, with a little dedication, and determination, there is no way you can’t find your market and get in front of them. There is a lot you can do with Facebook and a lot of data they can provide. However, at its most simplistic state, the most important lesson on Facebook is to simply create a Facebook ad. With this, you can get your book out there and start driving sales. 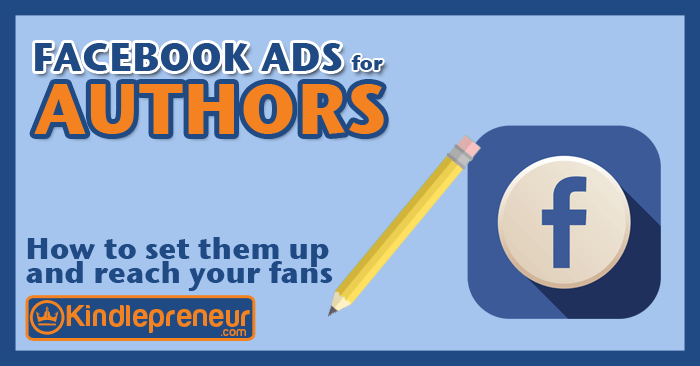 Let’s take a look at how to do exactly that: Setting up a Facebook ad for authors. In order to place a Facebook ad, you must have a specific page created. It is not possible to use your personal page. Creating a page is free and easy. Once you have a page, you can move on to the actual process of creating a Facebook ad for your book. In order to access the maximum level of functionality while creating your Facebook ad, it is important to use Google Chrome. Other browsers sometimes cause conflict with the Facebook ad creation user interface. The worst case scenario, if you use a browser other than Google Chrome, is that the browser crashes and you lose the ad you were in the process of creating. If you haven’t already installed Chrome, doing so is quick, easy and free. 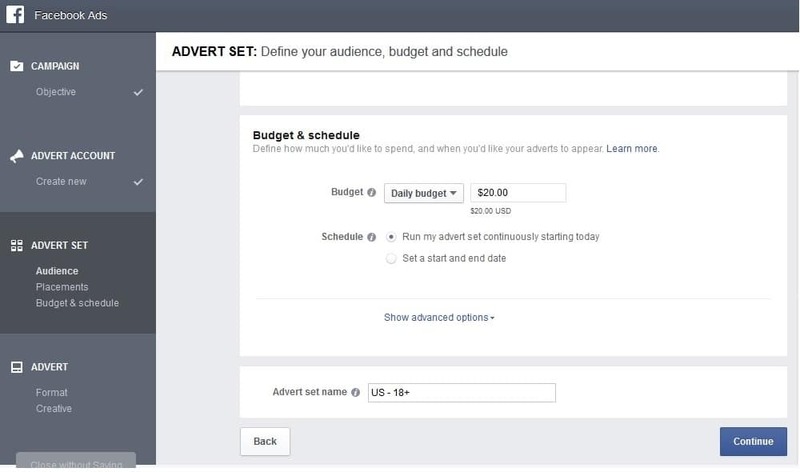 There are several ways to take the first step in the actual Facebook ad creation process – you can either click the ‘create adverts’ link under the drop down menu found on the top right of the Facebook desktop layout, as shown above, or you can click the green ‘create advert’ button which is found on the left of the desktop screen, under your favorites tab. 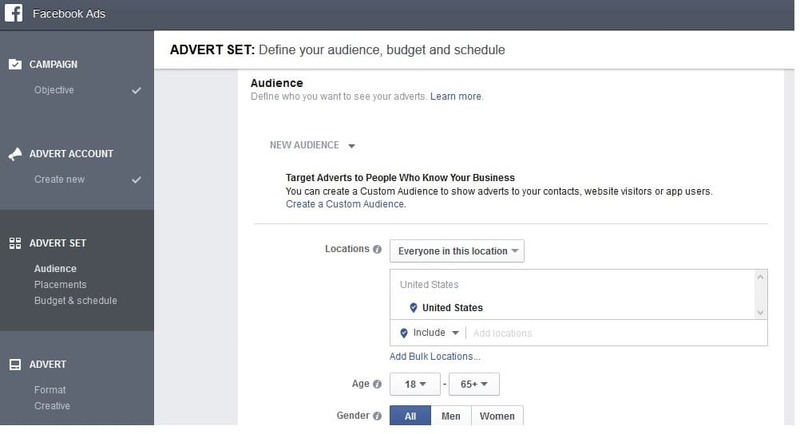 Either option will open up the Facebook ad screen, which has a separate structure and user interface from the main Facebook area, as you will see. For the purposes of this step by step guide to Facebook ad creation, it will be assumed that you have never created an ad on Facebook before, and haven’t yet set up a Facebook ad account. This is the first part of the Facebook Ads interface that you will come across. This step requires you to choose your advertising objective. There are a large variety of different objectives which you can choose. Basically, an objective is the end result you want to achieve by running a Facebook ad campaign. Knowing which objective to choose is difficult. Choosing an objective which is incompatible with your marketing plan will result in undesired results and wasted time and money. Most people go through a process of trial and error when first choosing an objective – the only way to avoid this is by learning from someone, preferably someone with a similar aim to your own, who has learned the inside story of which objectives work for different situations. As you can imagine, knowing when and how to choose objectives like ‘increasing conversions on your website’ and ‘getting people to claim your offer’ requires specialist knowledge. They are very, very powerful objectives which can do great things for your book marketing efforts – but you need to know what you’re doing – as money can and will be wasted otherwise. 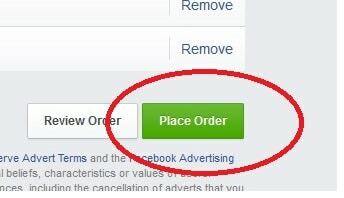 For the purpose of this step by step guide, we have chosen ‘clicks to website’ as our Facebook ad objective. This would be a website promoting a book – perhaps a page getting people to sign up for your mailing list in exchange for a chapter, for example. Once you have chosen your objective, click the blue ‘create advert account button’, as seen in the above image. This will progress you to the account creation screen (don’t worry, it’s relatively quick and painless). As you can see, all you need to do is enter your country, the currency you wish to work with and the timezone which you are in. There is an ‘advanced options’ section but you don’t need to worry about that for the purpose of placing your first ad. So far, this guide has explained how to set your campaign objective and create your advert account. We now move on to the first step of the ‘advert set’ stage – defining your audience. As you can see from the above image, you first choose a basic location, such as a country, and then specify particular locations within that country, such as cities, or even smaller areas, like your local town. You can also choose basic demographic information such as the age and gender of the people who will be targeted by your ad. If you have determined that your readership tends to be a particular age and gender, then make sure to set this information accordingly. There are a lot of powerful, advanced targeting options, such as choosing people based off their interests, their behavior, their likes and other advanced combinations – but to use these requires in-depth knowledge which would distract from this guide. Getting to grips with the advanced targeting options is an incredibly powerful way to grow your audience and sell more books. The next stage of the ‘advert set’ process is choosing where your Facebook ad will be placed. 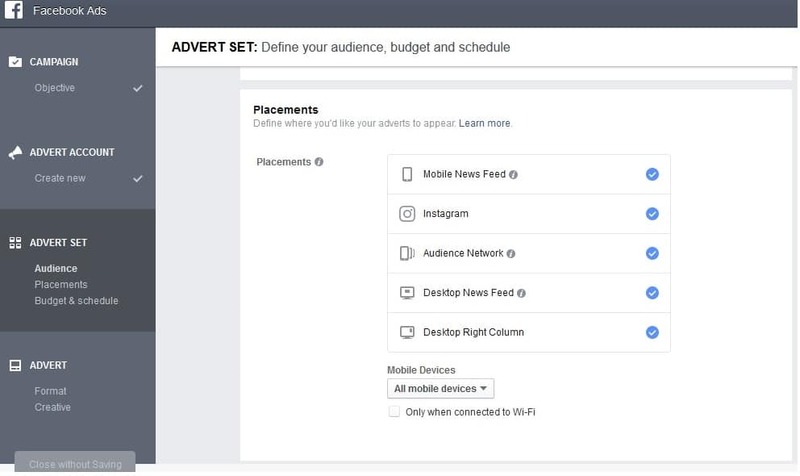 As you see, you have the option to specify exactly where your ad shows up – on people’s mobile news feeds, their desktop news feeds – even on Instagram. You will also notice that you can specify exactly which mobile devices your ad is displayed on – and even choose to have your ad only show up when the device is on a wi-fi network. Hopefully, you are beginning to see just how specific and detailed the Facebook ad platform is. 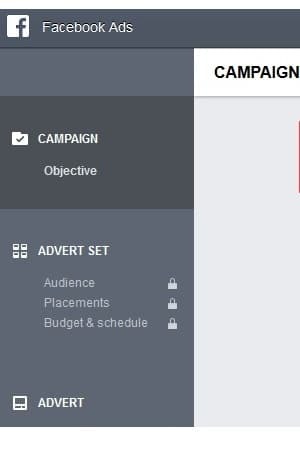 The final stage of the ‘advert set’ process is determining a budget and a schedule for your campaign. As you can see from the above image, it is possible to set a daily budget. The minimum figure for this is $5, although obviously a higher spend will get you better results. 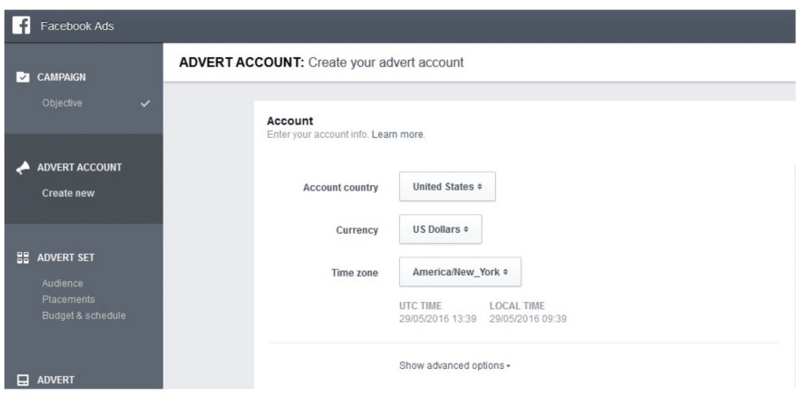 You can also choose to either run your ad continuously or to choose a start and end date for the campaign. When you are just starting out, it is important to set a defined start and end date for the ad campaign. 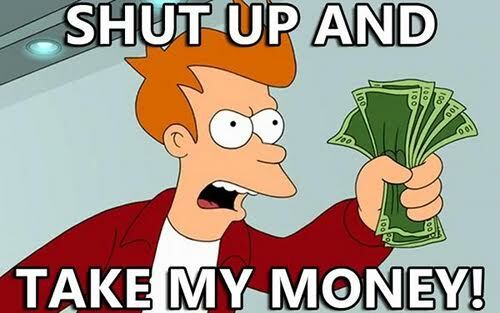 Your ad expenditure is billed to a credit card. This means that it is easy to forget about an ad which is set to run continuously and unintentionally run up a large Facebook bill! The advanced options with regards to budgeting and scheduling are beyond the scope of this introductory article. However, a word of caution applies. Until you know exactly what you are doing, stick to setting a modest budget with a clearly defined start and end date. Choosing a daily budget is the simplest way to get started as it ensures that your spend is spread roughly evenly over the length of your Facebook ad campaign. This is the third and final tier of the Facebook ad creation process – the ‘advert’ level. This is where you create the actual advert which will be displayed to the Facebook users you have targeted. It would be impossible to tell you exactly what type of ad you should create – only you know what your intended audience will respond to (or at least you should!). On a cautionary note, it is important to stay within the guidelines of Facebook’s rules and regulations – or you risk having your ad pulled. It’s important that your ad is eye-catching on a visual level and compelling enough to draw a Facebook user’s attention and make them want to click it. Once you have finalized all of the creative aspects of your ad, and specified any further details required (such as which website you which to direct clicks to), all that’s left to do is click the big green ‘Place Order’ button as seen above. Once you place your order, Facebook will take time to review your book ad. This is an automatic process which usually doesn’t take long – your ad will often be live within the hour, and usually even sooner. Sometimes, your ad may be flagged. If this happens, Facebook will email you directly. If you respond to the flagging email, you will be able to correspond with a human customer service agent who will help you to resolve the issue. Often, the reason you are flagged will be incorrect, and simply trying again via the response email will often be enough to have it go live. Listen to my podcast episode with Johnny Andrews, where we as book marketers discuss the pros and cons of Facebook Ads and AMS Ads on Amazon. Knowing how to setup a Facebook advertisement is just the first step towards success. In truth, the difference between the Mark Dawson’s of the publishing world and the ones who fail, is that Mark studied Facebook, gained immense knowledge on all facets, developed experience, and now has major intuition on how to use it. He’s mastered pixel placements, audience creation, A/B testing, conversion increasing and much more. If you are interested in making that commitment and mastering Facebook, then I’d highly recommend taking Mark Dawson’s Facebook Course For Authors. I just finished it myself. Even though I’ve taken courses from other big time Facebook Masters, this was by far the best one. One of the best things about taking Mark’s course is his authenticity. This isn’t some faceless online marketer trying to get inside your head – this is a battle-scarred indie author who has learned lessons the hard way – so you don’t have to. The course is balanced between being understandable for complete beginners and giving advanced tactics and approaches that Mark has personally perfected to produce epic results. The learning curve is superb and the information is well structured into different modules. All of the course content is available both as video, which you can either stream or download and as a text transcript. This makes it easy to digest and review Mark’s wisdom – even on the move. If you decide that Mark’s course is something that could help your publishing career reach the next level, and you signup with my affiliate link, I will personally offer a one-hour coaching session related to your first Facebook ad. Signing up through the affiliate link won’t cost you a penny extra.Click Here to Get Started! Hopefully, your eyes are now open to the immense possibilities of Facebook ads for books. 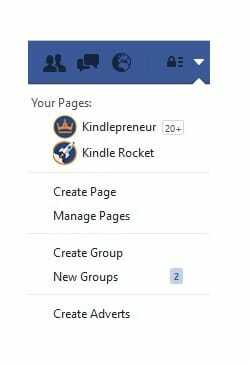 You know that Facebook offers a proven way of reaching readers and thus help you grow every aspect of your publishing career. You have an easy to follow method by which you can setup your first Facebook book ad (try saying that ten times fast!). 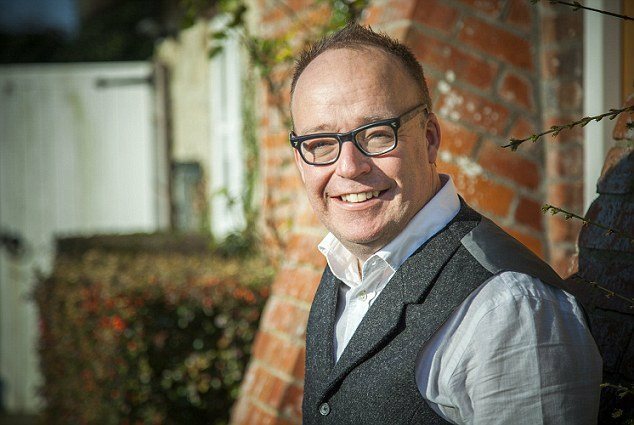 If you want a proven expert to give you the best quality information, and most advanced strategies related to advertising a book on Facebook, there is none better than Mark Dawson’s course. And if you signup for his course through this link, we’ll spend an hour together talking about how to make the most of your book marketing efforts.Click Here to Get Started!